There's one more part of the playboat overhaul that I should document and that is the relocation of the deck beam at the back of the cockpit after I had already put the skin on the boat. Messing with the frame is best done when the skin is off the boat, but it wasn't until after I put the finished boat in the water and paddled it that I discovered that it would be better if the back deck beam were a few inches farther back so it would line up with the back of the coaming . 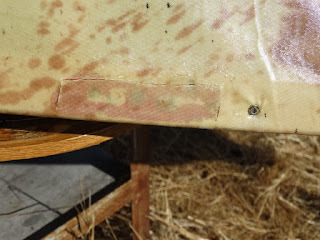 The main problem was that since it didn't line up with the back of the coaming, it jabbed into my back when I was paddling. 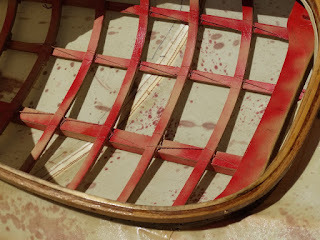 It's one of those things that don't reveal themselves till you actually use the boat, kind of like too tight shoes. The back of the cockpit is on the right. You can see the deck beam that supports the back of the coaming sticking out a good three inches in front of the coaming's back. Had to fix that. Here's what the fix looked like from the outside when done. 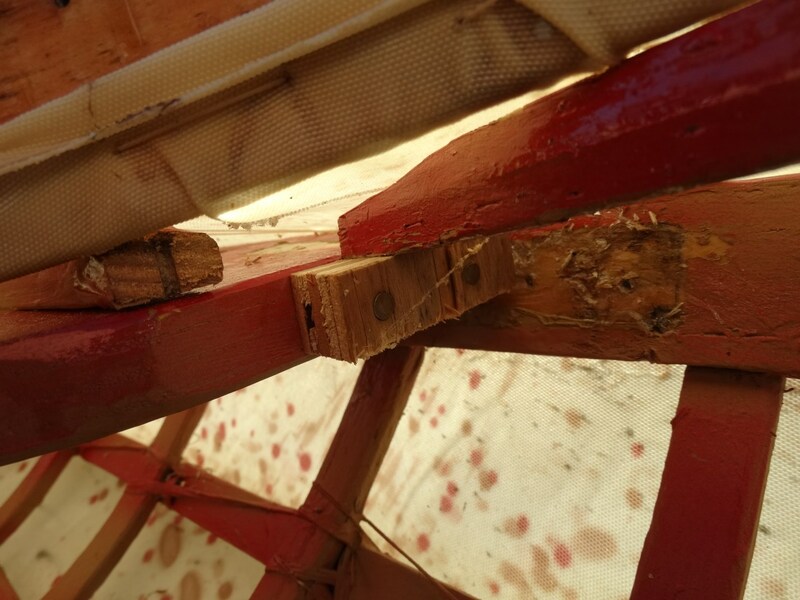 I had to cut the skin to get at the three stainless steel screws that were holding the deckbeam in place against the gunwales. I had to do this surgery on both sides of the frame. 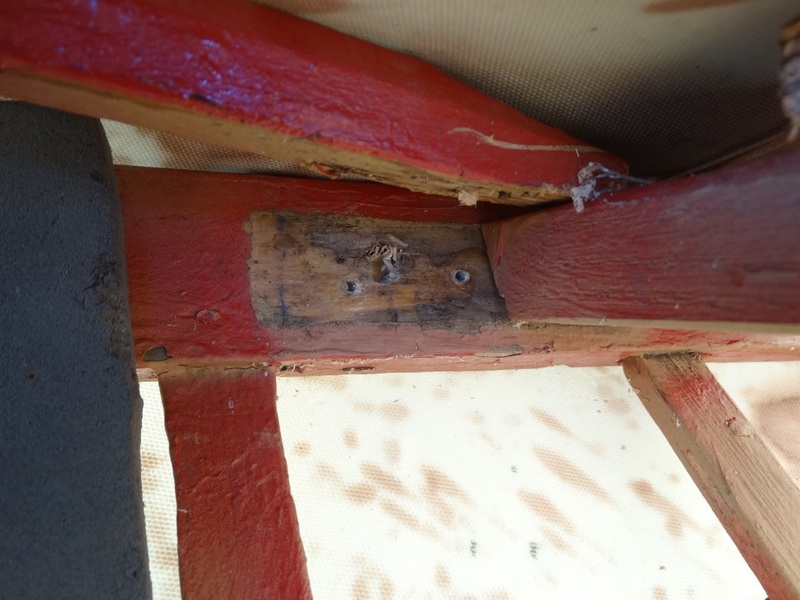 Once I had the screws out, I had to cut the pegs and lashings that secured the deck beam to the deck stringers. 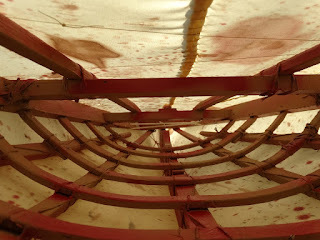 Once the deckbeam was free, I trimmed it down to fit farther back in the boat and re-attached it to the gunwales. What you see here is the net result. The deck beam is still held in place by three screws. Two of them under the skin flap that I glued back down and one off to the right of the skin flap screwed right through the skin. 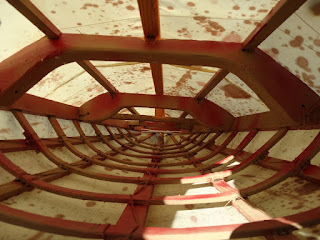 Here's the view of the relocated deck beam from inside the boat looking up. That red piece of wood at the top is a carlin that supports the side of the coaming. The exposed wood shows where the deckbeam used to sit. View of the surgery on the other side of the boat. I also had to add a support for the carlin, nailed it to the edge of the deck beam with bronze ring nails. And that should be the end of coverage for this kayak remodel unless some other thing comes up that I haven't discovered yet.